Sure, Bite Squad brings meals to the hungry masses from Seattle to Bethesda, but Co-founder and CEO Kian Salehi doesn’t think of his business as a delivery company. Instead, he says, it’s all about logistics. “That’s what we are; ultimately, we’re a logistics company,” Salehi says as we talk in his office on the second floor of a nondescript building in Minneapolis. On the other side of the wall, in a call center-like room, employees are just beginning to field customer- service inquires and connect with drivers as Bite Squad ramps up for the lunch rush. 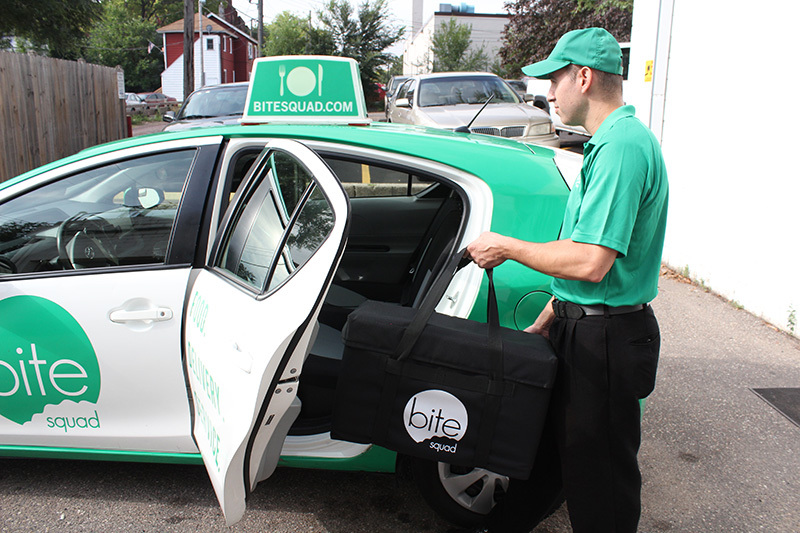 With in-house developed technology, Bite Squad uses an algorithm that measures cooking time, the number of orders being placed, available drivers and even traffic flow to generate a precise arrival time. Customers, who place and track their order in real time online or through the Bite Squad app, get a text or call when the driver—whose photo pops up—is nearby. “We’re the only company nationally that employs our own drivers, and we focus exclusively on food delivery,” Salehi says, noting their “strict enforcement” of drivers using hot bags and being in uniform. Other third-party services such as Postmates and DoorDash contract with drivers to make deliveries and don’t enforce a standard uniform. 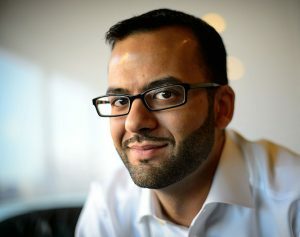 Salehi and business partner Arash Allaei launched Bite Squad in 2012 under the umbrella of Kasa Capital, the company they founded in 2008 to create or buy tech-focused startups with a consumer focus. At one time they ran daily deal site, Crowd Cut, and gift/floral delivery service, Gift Squad, but now “we spend 110 percent of our time on Bite Squad,” Salehi says. When it started, the service had 17 restaurants online in Minneapolis and five drivers. Today, hundreds of drivers are delivering food from restaurants in Austin, Denver, Las Vegas and other cities; Salehi expects to be in more than 30 markets by year-end. Its growth come through a combination of building Bite Squad from the ground up in some cities and, more recently, through acquisitions. Bite Squad launched in Bethesda, Maryland, in September 2016 after it acquired the market from Takout Taxi. Other acquisitions are bringing Bite Squad to Honolulu, Phoenix, Columbus and parts of Florida later this year, while a separate deal will add another 16 new markets. “2017 will really be a year of integration for us. Taking all these companies and putting our fingerprints all over it,” Salehi says. Despite his own company’s new-market moves and acquisition announcements from other players in the space, such as GrubHub, which earlier this year bought Los Angeles-based LAbite for $65 million, Salehi doesn’t see a one-winner-take-all future for food delivery. There will be continued consolidation, yes, but it’ll be those with superior technology who will come out on top, and Salehi expects Bite Squad to be among the leaders. There have been signs that some Silicon Valley food delivery startups may be faltering. Postmates reportedly has been slow to raise money with its latest round of financing, while DoorDash, which had initially sought a $1 billion valuation, raised $600 million in financing last January (2016), the same valuation as the previous round. Then there’s Caviar, the San Francisco-based company purchased by Square in 2014 and which the payment-processing service is now reportedly trying to sell. Bite Squad, by contrast, was self-funded by Salehi and Allaei for its first three years. Only recently have they completed two small funding rounds, both locally. While he declined to provide fundraising details or sales numbers, “There’s been a fundamental change in the way people want to eat,” Salehi says. And Bite Squad is positioned to capitalize on it.